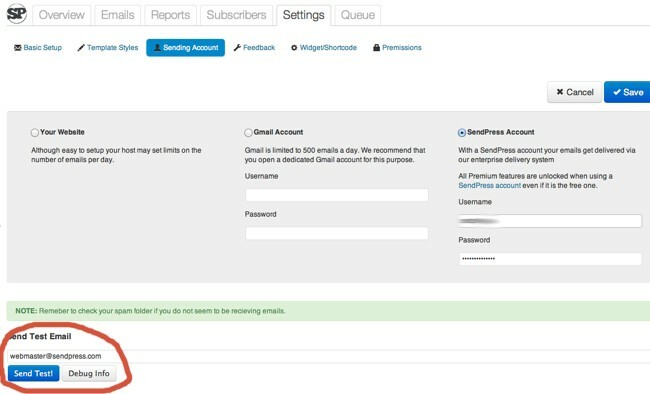 If you are having a problem sending, try sending a message using the "Send Test Email" option at the bottom of the sending account page. This will print out debug information if it finds a problem such as ports not open. This works whether you send from your own server, Gmail, or through us. If you find any errors with the send test email option you can contact your hosting provider to see if they will resolve them for you. Typically, sending from "your website" will require port 25 the open, while sending from Gmail will require that port 465 be open. The last and most common reason that email does not appear to be received is because it is getting marked as spam. Please double check your spam folder. If the message has left the SendPress Queue then it has been sent.